We created the internet-renouned Z-Bed this week. After months and months of searching for a used Westy Z-Bed without any luck, we decided to bite the bullet and do it ourselves. We purchased the hinge kit from Bus Depot. It comes with "directions" that really aren't that helpful, they're also not converted into inches. If you did use all of the measurements, you'd quickly realize that the plans don't really add-up (maybe we were missing something!?). Also, the kit is only half of a kit, as it's missing all of the screws/bolts/nuts - so you have two options: A.) make sure to purchase the corresponding hardware pack or B.) buy them all yourself separately (there is a list of what you need in the instructions). Overall, you can loosely use the instructions provided in combination with these dimensions from the Samba. Ours is shorter length-wise than the bench shown on the Samba thread because we are going to be installing cabinetry. We also already know that we are going to modify this original set-up to move the hinges down (but won't have time to for another two weeks). We'll update this post once we do so! Cut Seat-Back and Seat-Base, then apply hinges. Note that the seat back should be 1/2" shorter in length than the seat base in order for the hinges to align properly. Also, if you place your wood on the base too close to the hinge, you may need to chisel out some wood in order for it to swing into the lay-flat position (we did, anyway :p ). Fold Seat-Back and Seat-Base into seated position, then mark placement of hinge on the base, and affix the hinge. Place in van and secure to Firewall. 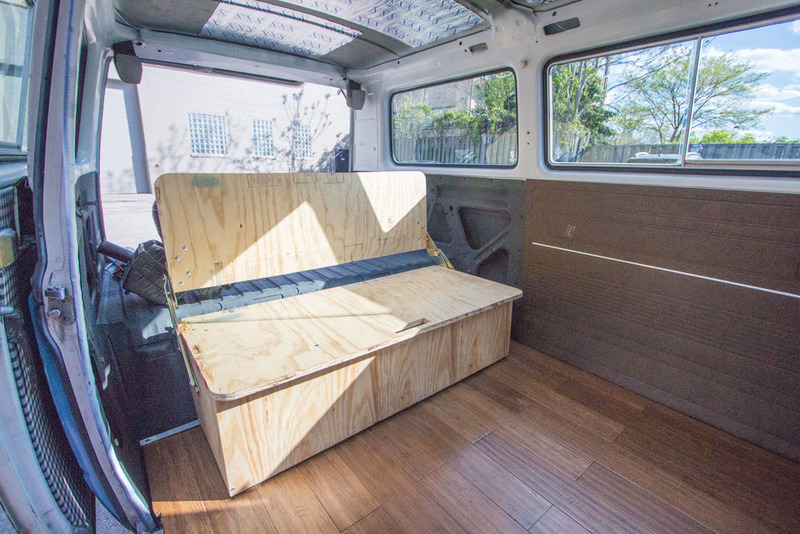 We found that we could re-use the old seatbelt holes and fixtures from the old passenger van seats in conjunction with a perforated metal bar because the thought of drilling new holes through the firewall wasn't all that appealing to us (seems too risky!). We also used 8 corner joints to affix the base of the bed frame to the floor on the inside of the base. Bam! You've got yourself a bed! As you can see in the last photo the bed is a few inches higher than desired. So we will cutting the two base side-panels down a few inches and moving the hinge down a few inches. We will be keeping the front panel at the height it is currently, so that the seat will have a slight angle like that of a passenger seat. Stay tuned for the update in a few weeks! In the mean time, I continued to rip out the headliner in the front and take apart the upper AC unit. It’s much more spacious now that it’s been removed! I’m not sure what are next steps to remove the AC tubing will be. Right not we cut them and they are just dangling behind the driver seat. There is also still a bit of glued “fuzz” left on the ceiling from the sound-deadening pads, so I think we’ll have to use prep-sol to attempt to delicately remove it next weekend. Today was D-Day [as they say on HGTV], Demo Day! It's cold out. 22 degrees cold. We started our morning walking the dogs in snow flurries - but that didn't hold us back from our first Vanagon project - it's D-Day! Mike and I were determined to start gutting Burt. Our first step was to pull up those original vintage '83 carpets [the HGTV-addict in me was joking "what if we find the original hard wood floors underneath!" haha] and step two was to fix the antenna for our radio. Ripping the carpets out wasn't as tough as I would have anticipated, they were so old and dry-rotted that they pulled right up. We were hoping to find some treasures hidden under there, but only turned up with 50 cents and a really old used lollipop stick [ick!]. Luckily we will still be able to use the base floor padding - it's still in good condition. Now that the carpet's removed, the next step will be to add the sound proofing and flooring. We knew there were issues with Burt's radio when we got him. My 2.5 drive home with him from Madison was 100% silent [if you don't count the clanking of the engine and squeaking while shifting gears]. We had to remove the grill and front headlight to get into the wiring on the front. As we did we found the original antenna smashed up [must had been from a small fender bender] inside that front pocket and removed it. After a few minutes, viola! We had a working radio antenna! Woo hoo! A Man, A Van, A Plan.